You need to organize the metrics to interpret the metrics. The questions of what you seek are critical. Do we have the fundamental metrics that the business needs to understand the health of the business? Within the channels of my function, how do I use metrics to ensure that my efforts are working? Do we have the capabilities to answer the ad-hoc questions that come up in business? Discover fundamental metrics to understand pipeline health. Do we have the capabilities to answer the adhoc questions that come up in business? Jeff is a Marketing and Product Management executive with a focus on startup and high-growth technology companies. Jeff excels at applying the right mix of marketing for the right stage of company in order to maximize growth. 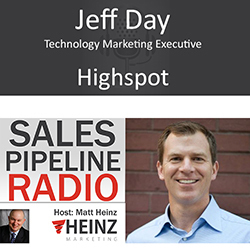 With 20 years of proven success with companies such as Highspot, DomainTools, Apptio, Enodo Software, HP, PolyServe and Intel, he has run all aspects of marketing and delivered industry-leading software and hardware products. He is passionate about working with high growth product companies to help drive marketing and product strategy, build happy and productive teams and maximize company success.